Artist Sarah Hatton has created a series of works using thousands of dead bees displayed in spirals symbolic of agriculture. She wants to bring attention to bees' decline due to pesticide use. A detail from one of Sarah Hatton's bee art works. 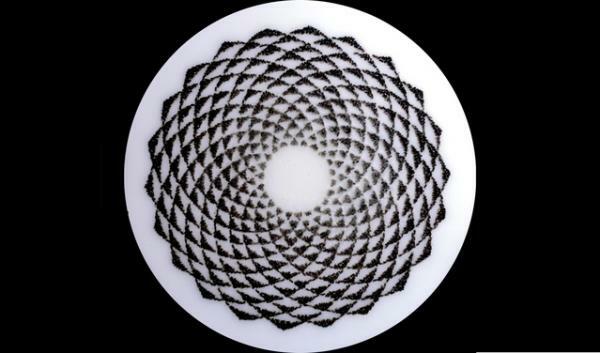 She's created spiral patterns using dead bees to bring attention to the pollinators' decline. A headline at green blog Inhabitat mentioning ‘thousands of dead bees’ and ‘dizzying mandalas’ drew me in. The image that greeted me when I clicked through did not disappoint. ”I am a visual artist who also happens to be a beekeeper. Life often finds its way into one's art, and I had long been thinking of an artistic way to talk about the global decline of the bees. 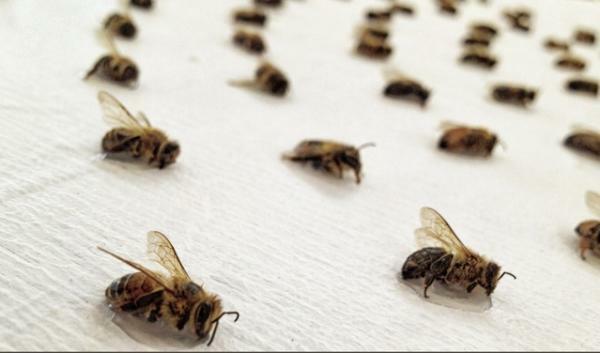 I decided to use dead bees as the most direct visual way to represent this message, with the most emotional impact,” Hatton wrote. The bees used in Hatton’s art work actually came from two of her own hives, which died from natural causes. Hatton says she chose patterns that “have symbolic ties to agriculture.” And further, the ‘dizzying’ effect of the patterns is meant to reflect the effect of neonicotinoid pesticides, which Hatton says, “destroy bees’ navigational systems. If you happen to be in or near Ottawa, Canada, you can see Hatton’s ‘Bee Work’ in person at a one-night showing December 4. Just this week, Oregon’s Department of Agriculture announced they will restrict use of pesticides containing two specific neonicotinoids. The action is in response to die-offs this summer that killed more than 50,000 bees. Another more artistic response to the Oregon bee die-offs comes from Portland poet and visual artist Pattie Palmer Baker. She said that the news of the bee deaths haunted her. ”I thought about how it looked. It made me see it visually,” Baker told me. The event prompted a poem which she exhibited as part of a recent gallery show in Portland. Though Baker’s art work typically combines paste paper collage and calligraphy, for now the words stand alone. Baker intends to evolve the work to include the visuals soon. Copyright 2013 ERTHFX. To see more, visit .